dance floors, tent flooing, tables, chairs, linens. rain and wind from spoiling your party. exactly what you may or may not need. We have never had to heat a tent in late June, July or August. We have heated tents in late May, early June and early September. April and October plan on using a large amount of heat. Tent side walls are a must when heating a tent. on the inside. 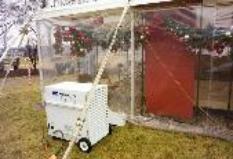 (If its a windy day, moving the heaters inside the tent makes them more effective). Using multiple small heaters rather than one large heater makes a tent more comfortable. Tent heaters are controlled by a thermostat similar to a house thermostat. The heaters we use are UL listed for tent heating. They come in 2 sizes 80k BTU per hour and 170k BTU per hour. (We have a heating specialist on staff that will assist you with your heating needs).